NYC Parks Tree Preservation Senior Project Manager Danielle Gift reflects here on her experiences attending the Partners in Community Forestry (“Partners”) Conference, which includes the affiliated Society of Municipal Arborists (SMA) Conference. The next Partners will take place November 20-21, 2019 in Cleveland, just after the SMA Conference November 18-19. Partners is organized by the Arbor Day Foundation. Recently, Council members such as Past President Andy Hillman, Secretary Steve Harris, Board Member James Kaechele, and myself (Blog Editor Michelle Sutton) attended the Annual Conference of the Society of Municipal Arborists (SMA). It was held November 13-14, 2017 in Tulsa, Oklahoma prior to the Partners in Community Forestry Conference on November 15-16. SMA conferences are open to and welcoming of anyone and everyone interested in urban forestry but tend to draw most from professional city foresters, parks superintendents, state UCF coordinators, urban forestry nonprofit staff, and the like. Many continue on to the “Partners” conference, organized by the Arbor Day Foundation, where they are joined by hundreds of community forestry professionals, volunteers, and activists. A bus tour of Tulsa (human pop. ~ 400,000) highlighted the long and productive collaboration between the Tulsa Parks and Recreation Forestry Section and the nonprofit group Up with Trees, founded in 1976. Urban forestry in Tulsa was first formally recognized in 1992; its longtime city forester, Mike Perkins, recently retired from the City and went to work as operations manager for Up with Trees. Arborist Dave Zucconi then took the city forester position, rising from the ranks of Parks and Recreation. Tulsa benefits from the longtime positive working relationship between Perkins and Zucconi, who gave a very animated tour and are rightfully proud of their accomplishments and those of their colleagues. 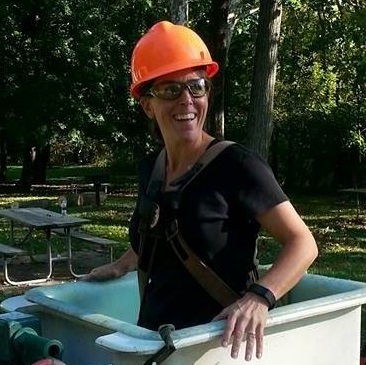 ISA Certified Arborist Christine (Chris) Manchester is the naturalist and sustainability coordinator for the Town of Dewitt, and as such she is heavily involved in the oversight of Dewitt’s urban forest. The NYSUFC provided financial assistance to Manchester to reimburse some of her expenses to attend the Partners in Community Forestry Conference last November 16-17 in Indianapolis. Additional support was provided by the Arbor Day Foundation and NYSDEC. “I can’t thank the Council enough,” she says. “I had a great time, met some very interesting people (there were 559 registered), and gained valuable information. Thank you for this opportunity.” Manchester prepared a presentation about her take-aways from the conference and how they apply most to the work that she does for the Town of DeWitt. That presentation is excerpted here. The opportunity to network with this many people who are facing many of the same challenges nationally doesn’t present itself every day. Through an informal tally, the majority of people raised their hands that they had been in urban forestry for less than 10 years. There were so many incredible presentations—but there were a couple of topics that resonated with me more than others. The take-aways for me were: 1) partnership/collaboration, 2) thinking about trees as infrastructure and incorporating plantings into streetscapes and 3) focusing on planting trees in poor residential areas. Two posts ago, Mike Duran-Mitchell shared reflections from the 2014 Partners in Community Forestry Conference that took place Nov 5-6 in Charlotte, NC. Just prior to Partners were professional meetings and conferences like that of the Society of Municipal Arborists (SMA). I edit SMA’s online magazine, City TREES, and have been lucky enough to be sent by the Society to its conferences for the past ten years. Charlotte was a special conference for SMA, as this year it marked the organization’s 50th Anniversary. SMA was founded in 1964 by eight municipal arborists who met in Olmsted Falls, Ohio to discuss founding a professional society. They wanted to elevate the status of the profession and provide educational opportunities and camaraderie for its members. There were 21 founding members; today, SMA has more than 1400 members from around the world. Most of the members are municipal arborists or urban foresters, but some are parks superintendents, DPW directors, landscape architects, and some are community volunteers. SMA is for everyone who cares about the urban forest! SMA Vice President Jeremy Barrick planted a tree with his kids to celebrate SMA’s 50th Anniversary. To celebrate the 50th Anniversary, members planted trees in its honor and posted pics of the tree plantings on the Society’s Facebook page and Twitter feed. A celebration at the conference took place, with a photo roll of images from throughout the Society’s 50-year history, and with a beautiful sheet cake that attendees ate for dessert at the Tuesday night banquet. Noteworthy in the photo roll was the presence of increasing numbers of women at SMA events over the years! Very popular among this year’s attendees was a pre-conference workshop at Bartlett Tree Laboratory in Charlotte. There, participants learned about research on the effects of different types of growing media on tree growth; elm cultivars and pruning of them; and rootball disturbance experiments. You can count on Mike Duran-Mitchell to live-tweet important events in urban forestry, like our own NY ReLeaf Conference at Hofstra on Long Island last July and the recent Partners in Community Forestry (PCF) Conference in Charlotte. 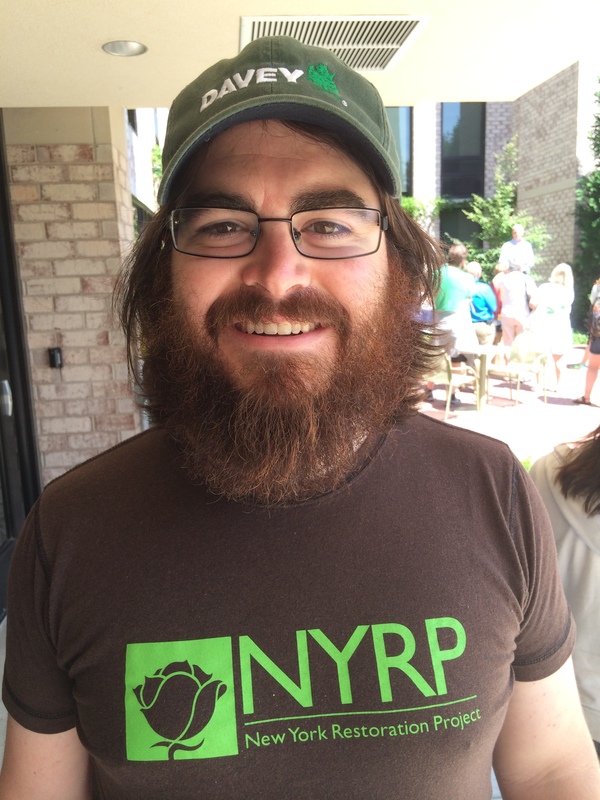 Mike is the Director of Tree Giveaways for the New York Restoration Project. Here’s a short reflection by Mike on the PCF Conference followed by some of his tweets, which are infectiously enthusiastic. Mike Duran-Mitchell: This year’s Partners in Community Forestry (PCF) conference, held in Charlotte, NC, was a wonderful opportunity to forge broad partnerships and share best practices from across the country. The challenge, issued by Arbor Day Foundation’s Dan Lambe at the beginning of the conference, was to think about your program through a “what if?” context. Whether it was the NYS Urban Forestry Council’s own Andy Hillman sharing an anonymous quote comparing the pain of “a trained volunteer who leaves” to the “untrained volunteer who stays,” a trip to the Bartlett Tree Lab to watch researchers chop up container-grown tree rootballs with an ax, or Dr. David Howlett at the Nevada Division of Forestry describing the results from researching biochar as a street tree planting medium, best practices were revealed to us through the “what ifs?” of programs involving planting, maintenance, stewardship, and many other aspects of urban and community forestry.